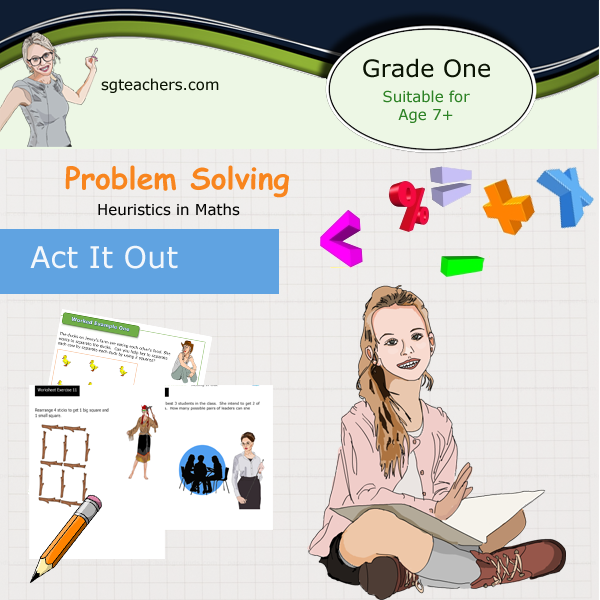 The workbook focus on one of the strategies in Heuristic Math known as "Act It Out". The strategy is to enable the learner to visualize the content of the problem and what is involved. They go through the actions of what the problem says and at the end come to a conclusion. The physical action makes the problem components and their relationship clearer in the students’ minds. Act it out is a crucial strategies. It makes students form mathematical concepts which are well established. It encourages them to be inventive, aids concept and skill development and boost the understanding of the process. Once they have practice with this strategy, they will be able to visualise the problem clearly which aids them well in solving non routine complex problems. Student using this method will develops innovation, confidence, creative and independence. It is a great strategy for student who has difficult to grips with complex problems and a great tool to simplify finding solutions. Many young kids enjoy using this strategy as they are taking the role of things in the problem. This is one of the series written for Understanding Heuristic Math. It is written accordance with the latest Primary Math Syllabus issued by Ministry of Education. This book develop their abilities to solve problems with the use of heuristic. This book provide the resources for teaching and learning. It is certainly a great resource for teachers and students who want to teach or master heuristic skill.